Everyone knows that girl. She always looks so put together, she stays on top of the current trends and has the most fabulous closet of clothes and accessories. She is a true fashionista. While this Best Dressed gal loves to add new dresses and necklaces to her clothing collection, she can be super difficult to buy gifts for. 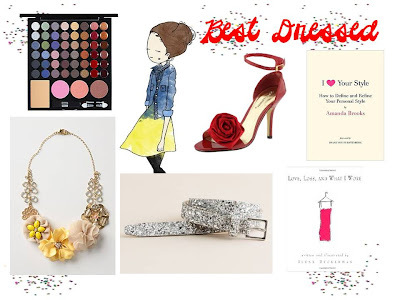 Here are my suggestions for the super stylish chick in your life. Sephora Color Play Palette ($24.00): What glamour girl couldn’t use a pallet of pretty colors to get her through the holiday party season? At a price of under $24.00, this is a steal! NanLawson Handmade Illustration, Etsy ($8.00): I love the idea of giving a friend a framed print as a gift. I know what you are thinking…but what if they don’t like it or what if it doesn’t fit their other décor...I feel like a print like this could go great in someone’s office or even bathroom. I’m sure they will find a place! If you have time, you can go for a full customized photo of your favorite glamour gal from Etsy seller Brooklit. Pierre Dumas Excellent Shoe from Piperlime ($49.00): Fashionistas will have a cutegasam over an adorable pair of heels. These fun red rosette shoes are great for any trendsetter to pair with an LBD. To research your friend’s size, pretend like you want to borrow one of her current pairs! Love, Loss and What I Wore ($5.19): The title of this book had me at hello. I’m not even sure what it’s totally about, I just mentally pair big moments in my life with what I wore. First Date – Jean overall/flower skirt combo from Express. First Day of College – Grey Capri pants and an orange tank (bold color choice, I know). First meal as an engaged woman – black and white poofy dress from Anthro. I can go on and on! J Crew Glitter Belt ($24.99): This festive belt can pair well with jeans, dress pants and/or to clinch the waist on a flowly dress.